Everyone on our team is committed to helping clients pursue their financial goals. Look at our experience and qualifications and we think you’ll understand why a select group of affluent families have made us the first choice to offer them financial advice and guidance. We look forward to the opportunity to discuss how our approach to wealth management just may be the right fit for you and your family. When you are deciding which financial advisors offer the best fit to help you manage your wealth, you tend to consider their experience, skill and commitment. We think those qualities are why wealthy families in South Florida and across the country turn to The Mordis Group for financial advice and guidance. Our team offers you a high level of service with the potential to enhance every aspect of your financial life. We pride ourselves on outstanding service, and we strive to be there when you need us. In fact, three generations of clients rely on us for insight to help them enjoy their resources now and strategies to help them preserve wealth for the long term. Our approach to client relationships begins with a dedicated process that seeks to understand your priorities, goals and present financial outlook. Private briefing – In our first meeting(s), we have conversations in which we listen to where you are currently, and seek to understand your financial personality, goals, aspirations and priorities. Discovery phase – We strive to analyze every aspect of your financial life, from your investment personality to your monthly budget. Our analysis will cover our income and investments, liabilities, business interests, insurance and risk management, real property and other non-liquid assets. Implementation phase – With your consent, we will put into action customized strategies, and tactics designed to address your priorities, liquidity needs, risk profiles and time horizon, and help move you toward your goals. Periodic reviews – We meet regularly to review progress toward your goals, recommend any strategic adjustments and get updates on any changes in your outlook or objectives. At The Mordis Group, we week to understand your priorities and concerns. We want to know the key factors that drive your decision making. This helps provide a foundation for our advice and guidance. Such insight helps us tailor strategies to your needs. Each person has unique goals and priorities. Those distinctions may impact the family’s current and future wealth structure. We appreciate the opportunity to work with the next generation, helping to prepare them for the eventual stewardship of the family’s assets. We evaluate the entire family’s priorities and interests. This process often leads us to propose new strategies that focus on the elements that matter most to you. The suggestions we make grow out of our disciplined process. They are informed by what we have learned by listening to you and reviewing your situation. Our team can offer recommendations for an integrated structure to help you streamline and organize your financial world. We offer strategies to help you do everything from paying your monthly bills, to saving for retirement, to selling a business. Our goal is to help you save time, money and effort throughout your daily life. What are your goals for the next 5, 10, or 20 years? It’s a simple question, but one that even some of the most successful business leaders, entrepreneurs and professionals haven’t yet fully answered. They just do not have the time. The Mordis Group seeks to help clients clarify and focus on their objectives and develop step-by-step strategies to pursue them. We see our job as simplifying clients’ financial life so that they can concentrate on their business and the people they care about. Whether you’re a corporate executive, business owner or a member of a practice partnership, our team can look at ways to help you make the most of your income, monetize business equity and convert equity and deferred compensation. Whether you’re looking to boost revenue, strike out on your own or see how long until you can retire, our team can offer strategies to help you get where you want to go. Because of our long experience working with a diverse range of affluent families, we can help you map out and prepare for key events, such as education savings, gifting for children starting new careers or families of their own, and retirement. Through Bank of America, we can also offer you access to lending strategies to help you prepare your finances for other life goals, such as the purchase of a new or additional home, boats and aircraft, and fine art and antiques. If you have philanthropic interests, we can show you potentially advantageous ways to give to charity and other causes. 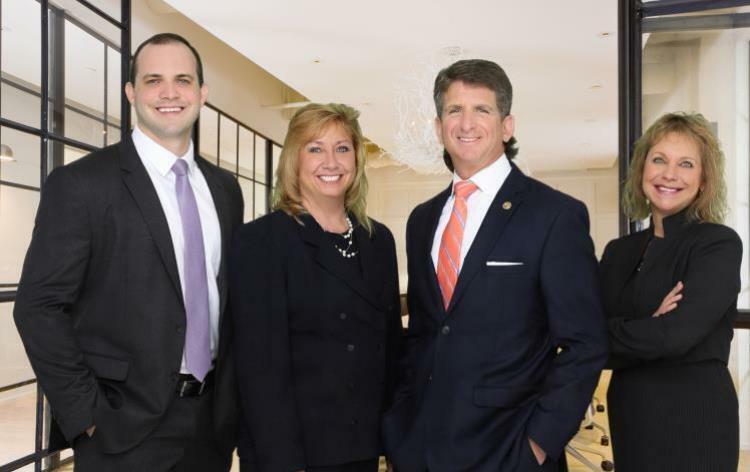 Our team can work with you and, with your permission, your lawyers and accountants to develop wealth transfer strategies to help you pass on your assets in ways that you intend. Among other techniques, we can consider trusts, family corporations and partnerships, insurance and gifting. Our team works with client families in an ongoing process, since time and life have a way of changing perspectives as clients advance on their financial journey. Once we understand what you want to do and where you want to go, we strive to offer a range of potential approaches, taking into account various life events and possible contingencies. Ask the clients we serve about their portfolio and one answer you’re likely to hear is: “Which one?” That’s because our team believes in customizing investment allocations to the client’s needs and goals. We may recommend highly liquid portfolios for routine expenses and emergency funds, intermediate-term strategies for three- to five-year objectives, and long-term investments targeting retirement and wealth transfer. If you chose, you can delegate to Barry the investment management responsibilities for your portfolios through the Investment Advisory Program, meaning he has discretion over certain investment decisions surrounding your investment strategy. Once Barry has confirmed your goals and life priorities, as well as identified your portfolio investment objective, time horizon, risk factor and liquidity needs, he will recommend targeted asset allocations for your portfolios to help pursue your specific investment objectives. Granting Barry authority allows him to respond to market changes, price volatility and global events with the ability to make adjustments, if needed, to help your portfolio stay on track toward your goals. This generation views retirement far differently than their parents and grandparents. Today’s retirees are living longer and making the most of this period of their lives. Through our disciplined process, our team will seek to understand your vision for retirement – when you want to retire and how you expect to spend your time. Based on what we learn, we can offer long-term investment and income generation strategies to help support your retirement goals, whether you want to set sail, volunteer, take classes or start a new business. We can also offer recommendations to address any special financial needs you may have in retirement, such as expenses related to health care or domestic assistance. Barry joined Merrill Lynch in 1998 and began his career in financial services in 1993, offering wealth management for affluent individuals, families and private foundations. He strives to establish meaningful relationships with clients and their families, with a focus on their priorities and goals. Barry concentrates on the wealth management process, client communication and helping high-net-worth families develop structure and discipline in the handling of their assets. He works to uncover not just the clients’ objectives, but their motivations as well. Barry holds the CERTIFIED FINANCIAL PLANNER™ certification, awarded by the Certified Financial Planner Board of Standards, Inc. Barry is a qualified portfolio manager, who in addition to providing traditional advice and guidance, can help clients pursue their objectives by building and managing his own personalized or defined strategies, which may incorporate individual stocks and bonds, Merrill Lynch model portfolios and third-party investment strategies. When servicing clients through the firm’s Investment Advisory Program, a portfolio manager may manage his strategies on a discretionary basis. Barry graduated from Indiana University with a bachelor’s degree in journalism. Community service is very important to Barry. He has been involved in the Rotary Club of Boca Raton/Sunrise for 20 years, serving as president, sergeant-at-arms and assistant district governor. Barry and his wife, Donna, live in Boca Raton with their two children Haley and Gabrielle. He enjoys reading, running and spending time with family. Justin began his career at Merrill Lynch in 2017 with the desire to help people define and achieve their financial goals. Through the disciplined and multi-faceted process of The Mordis Group, Justin strives to develop strong client relationships to uncover goals and motivations to help clients effectively manage their assets. Justin graduated from Florida Atlantic University in Boca Raton Florida, where he earned a degree in Finance (BA ’16). While in college he started his first company, an automotive aftermarket company. Justin owned and operated that business for half a decade. Eventually he sold the company because he felt it was time to follow his passion of helping others. In this, Justin spent large amounts of time with his grandfather, who lived in a 55-and-over community. He observed the financial difficulties many people face in retirement. It left a strong impression and from that experience, Justin resolved to help people manage their wealth in an effective way. For each client, Justin strives to deliver goals-based advice so they can live confidently. Justin is native to South Florida. He enjoys serving his community through the Rotary Club of Delray Beach. In his spare time he participates in racing and social events with the Porsche Club of America. Justin is also an avid salt water sport fisherman, and holds a United States Coast Guard 100 Ton Master Captains License.